Just over one year ago, with oil prices hitting $43 and falling fast, I suggested that the market was making a big mistake. My opinion at the time was that oil prices should have been rising, not falling. I based that opinion on the fact that global oil inventory levels had been steadily declining for months and that the amount of oil being produced daily was already below the amount of oil demanded. The global oil fundamentals were tightening which was a point that the market had completely missed (as evidenced by the falling oil price). What had happened was that traders were focused on the wrong data point. The market had been misled by stubbornly high U.S. oil inventory data numbers that I believed were being temporarily caused by excessive Saudi oil exports. So What Should We Be Looking At Today? Today, oil investors are rightfully focused on the chaos that is taking place on multiple fronts in the Middle East and on how sanctions will impact Iran’s production. Production from a very significant oil producing nation is imploding and the situation is only getting worse. On Sunday, Venezuela’s Nicolas Maduro secured himself another six years as president in what was by all accounts a “sham” election. That is terrible news for the people of Venezuela and for global oil supply. However, the Venezuelan oil industry is also in shambles. It is lacking tools, machines and money. With the country literally falling apart, the oil majors have fled. 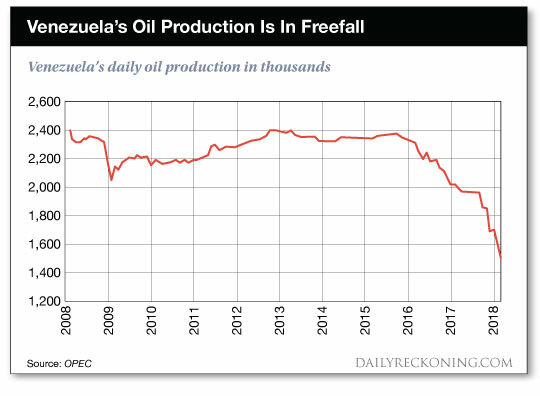 Production is in complete freefall and the situation is only going to get worse with the U.S. imposing sanctions on the country as a result of the Maduro sham election results. Keep in mind that Venezuela is an important global oil producer. The world needs this country to keep exporting oil. In 2016, Venezuela’s oil production was nearly 2.4 million barrels per day. Since then, production has collapsed by a shocking 1 million barrels per day and conditions keep worsening. 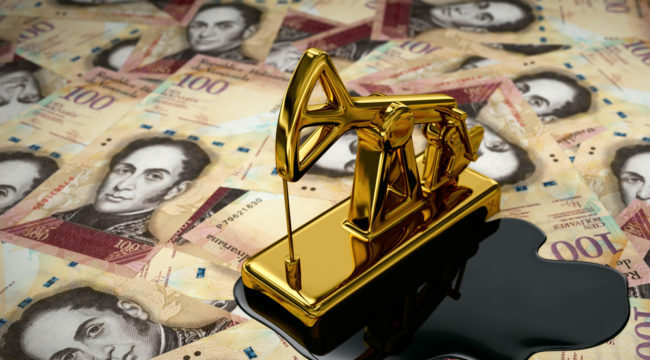 Analysts believe that by the end of this year, Venezuela could be down to only 1 million barrels per day of production which would take yet another 500,000 barrels per day of supply off the market. In 2014, oil prices were in excess of $100 per barrel. By early 2016, we saw oil trade as low as $27 per barrel. Is it possible that in 2018 — just another 24 months later — we could get back to $100 per barrel? And that it could go even higher if Iranian production is hit hard by the sanctions freshly imposed by President Trump. With Venezuelan production continuing to fall and Iranian production likely doing the same, realistically, the only man who could keep something of a lid on oil prices is the Saudi Crown Prince Mohammed bin Salman. Saudi production is currently at 10 million barrels per day. And with the highest level that we have seen from the Saudis at 10.5 million barrels per day, hypothetically speaking, Mohammed bin Salman could probably cover what Venezuela is likely to lose over the remainder of the year. Remember this man has a vision for a new Saudi Arabia by 2030 — a country not dependent on oil export revenues. Think about how ambitious that plan is, the man wants to create an entirely new economy in just over a decade. To have any chance of doing that the Crown Prince needs to milk the Saudi oil cash cow for every penny right now. Sometime in the next 18 months Saudi Arabia is going to sell a piece of the national oil company (Saudi Aramco) to the public. The Crown Prince only gets one chance to do that and high oil prices would maximize the value received.